landscape, reshaping how people discover, consume and interact with digital media. Rovi occupies a unique position, providing content producers, service providers, device manufacturers and over-the-top video storefronts with innovative technologies and solutions that connect people and the entertainment they love. We’re delighted to share our perspective as we work together to satisfy consumer demands and achieve business success in the new entertainment value chain. 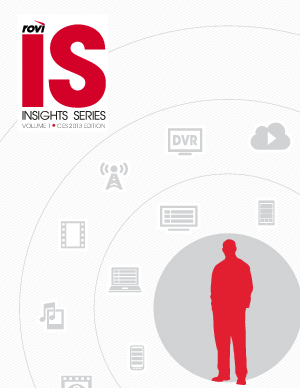 We hope you will find a useful resource in this first edition of Rovi Insights Series.